"The keys that open the world"
While contemplating how we could connect the consciousness of the world, the image of a Key appeared to us “that would open the gates of consciousness”. And so it was that we began to use them, and their purpose would be to serve as simple links that would allow the people who follow the creation of the planetary network to remain connected with an image and an object: each time we imagine or meditate on one of the keys, we would immediately become connected with each of the places where the keys would be deposited in the world. The keys would be a tool to maintain that connection over the entire electromagnetic field and planetary consciousness of 2012. 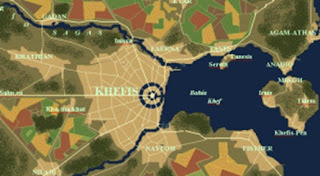 In the times of Early Atlantis, when the mythic empire was all but a few ports along the coasts of the great islands of the Atlantic Ocean, a legend arose whose echos are still heard today, although in very different way than they were heard in those times. 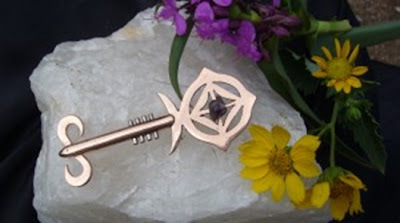 The legend said that by fusing certain elements, you could forge the Keys that would open the World. This Myth spoke about how different races had granted some strange materials to a few families, the feudal families of the islands, and that these materials came from other worlds, materials that were forged by blacksmiths and artisans of the Earth whose strength had the capacity to open new doors to Humanity. The wise ones guarded them and hid them away until the people who were meant to fulfill this work would find them, and be able to complete the opening by placing the keys in their corresponding places. Hundreds of people modified this story and many went in search of the 4 Keys; keys that, if everyone were to get their hands on them, would cause a New World appear in front of our eyes. This legend brought the small city of Khefis, capitol of Atlantis, to transform into the magnificent empire that we all remember. These keys were called the Towei Lumbar. 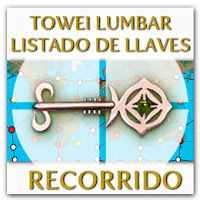 While we were arranging the preparations for our Trip, looking for answers on the levels of Universal Information, one of the Librarians said to me: “Remember that all the places you will go to in this World are Portals...and to open them you will need the corresponding key”. In that moment they showed me a key, which was the new Towei Lumbar. Upon seeing them, we did not hesitate in contacting an Artisan to carry out the work. They told us that these keys were a fundamental part of the Plan, and that their function was of utmost importance. Each key would open a portal that we would visit, and their function would be to keep the Consciousness of Humanity active in that place. 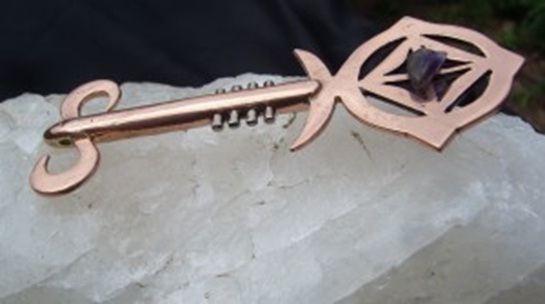 All the keys are made of Copper, which is the first material that was used by humanity as well as the material that represents Venus, and therefore, is a symbol of the Woman and the activation of the New Earth. Mario Alberto Silvestrin, the artisan who set to work on carving the keys, told us that he went through many trials when he was working on the keys, and that many forces prevented him from finishing his work. But something would always happened to give him the strength to keep going. He told us that after finishing the first 25, he felt that this was the most important service of his life. 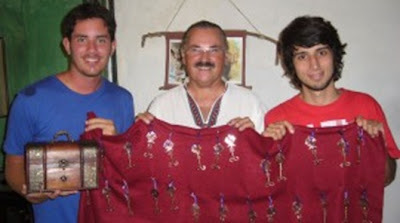 The exchange of the keys from the artisan to us was planned to take place between the walls of the intraterrestrial city in Capilla del Monte, Argentina. And so it was that a few days before departing on our world journey, we travelled to the town of Punilla to receive this great honor. That day, the night of February 3th, the forces of the 4 elements blessed the exchange of the keys amidst a storm that wrapped the skies in fine, bluish lightning rays, as if in a dream, pink, with fireflies along the river, cats standing guard in the distance cloaked in the shadows of the evening, with bright rays from the setting sun bathing the sacred mountain Uritorco amidst the shadows, which was encircled by two enormous and defined rainbows, one on top of the other, that stretched over our heads. 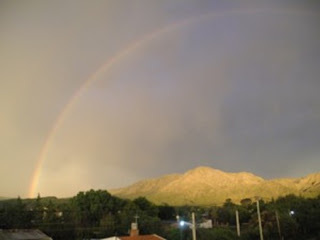 As each of the keys were presented, the rainbow would disappear a little bit, until the moment when the last key was given, and a ray of lightning made all the colours vanish, giving way to night and the light of the moon. The 7 people who were present knew that throughout the ceremony we were living within the fourth dimension, vibrating in a completely different reality, where fairytales come true. The keys were put into a chest and they remained there until they were presented to the Chakras of the Canary Islands before being deposited around the world. The function of this key is to be a concentrator of all the energy of consciousness. One of the objectives of Harwitum is to generate a mass Consciousness that will connect thousands of people daily as an anchor of planetary awareness. Each of our modern day Towei Lumbar has an electromagnetic field that irradiates between 15 and 40 kilometres, and if we deposit our consciousness in their copper, they will sustain the consciousness from around the world as a cable would, in each magnetic node of the planet. The Sun is the circle that encompasses the Earth, represented by a square that is traversed by the cross of the equinoxes and the solstices which are supported by three points, which can be pyramids, mountains or volcanoes. These are points of connection between the solar dimensions on the Earth, followed by the long staff of power which is crossed by four bars that represent the four forces of nature: Fire, Earth, Air, and Water. At the end of staff there is a symbol of infinity which is open, representing the possibilities of the universal, and the opening of the eternal This is also the symbol for the number 9 in the language of Sayontu (from 9000BC), representing the connection with the Christic level of the Heart. These keys are a symbol of the Union of the Great Consciousness of the Earth which will be deposited in each place of power, with the goal of activating and sustaining the entire Human Network, generator of the pillars of the New Earth. You are invited to turn the key and open the Gates to a New World.